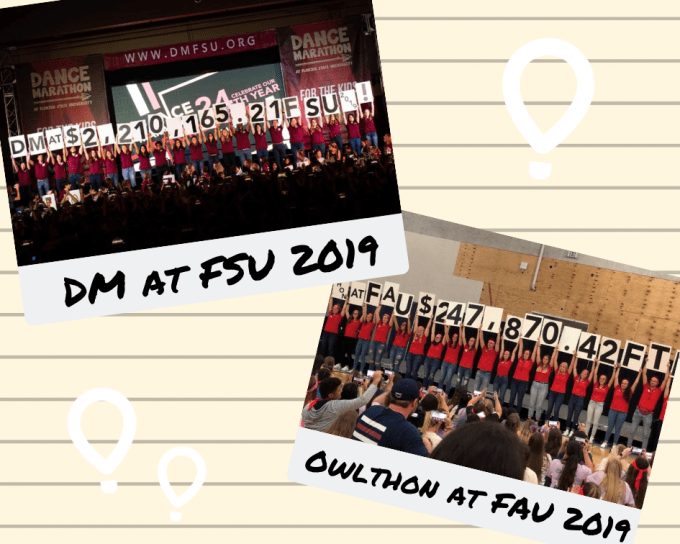 Dancers stood for over 13 hours for the 6th annual OwlThon at FAU. They raised a total of $247,870.42, which was more than $3K over last year’s total! There were almost 200 FAU students that participated on the day of the event. Three high schools participated this year. They raised over $45K cumulatively. High school integration with the collegiate program only began last year. This was also the first year that OwlThon introduced a strong captains program, in which the student body was able to join our expanding internal team on a much wider scale. DM at FSU raised $2,210,165.21 for this year’s event. More than 1,800 students participated and countless CMN ambassador families shared their stories throughout the weekend. Seven high school programs participated this year and raised $402,036 — a 75 percent increase in revenue over high school programs last year. DM at FSU will celebrate its 25th anniversary in 2020.